Norman Rockwell (1894–1978), Marble Champion, 1939. Oil on canvas, 28 × 22 in. (71.1 × 55.9 cm). Private collection. 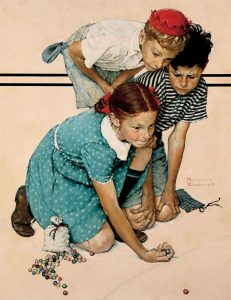 Marble Champion, a painting by Norman Rockwell, depicts three children crouching before a curved line that is drawn on the ground. There is a boy in white shirt, whose golden hair is bright beneath his red cap; there is a dark-haired boy in a black and white striped polo shirt; and there is a girl in a light blue polka-dotted dress, navy knee socks, and faded brown shoes. Her red-brown hair is neatly parted down the middle; on each side of her head, a braid is secured by a red ribbon. All three children are looking intently at the marble in the girl’s hand. The girl looks confident, determined, and focused. The overflowing bag of marbles on the ground beside her signifies that she is winning. The dark-haired boy, whose marble bag lies limp and abandoned on the ground, watches the game with the disappointed and slightly incredulous look of someone facing defeat. The second boy has stashed his own empty marble bag in his back pocket. The expression on his face is one of awe and amazement. The girl holds a blue and white swirled “clambroth” marble in the crook of her index finger and pressed against her thumb: she is “knuckling down” (putting her knuckle on the ground) to release the marble inside of the ring. This is a term that has been associated with the game of marbles since 1735. By the mid-1860s, however, “knuckle down” (and the related phrase, “buckle down”) had come to have a second meaning: “to apply oneself earnestly” (Merriam-Webster, 1977). 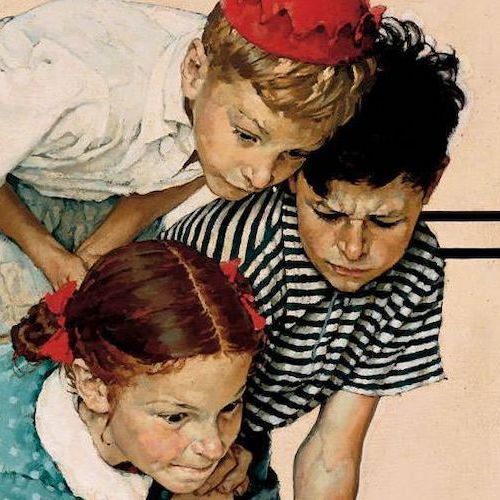 The girl in this Rockwell painting, who is intensely focused on winning, is “knuckling down” in both senses of the word. In 1939, when “Marble Champion” was painted, America was in the grips of the Great Depression. As millions lost their jobs and had to wait in bread lines, the average family was forced to knuckle down to make ends meet. For children, marbles offered a reprieve from the general suffering, but it also mimicked their parents’ fight for survival. The equipment required for playing marbles is relatively inexpensive. In addition, the game is played “for keeps,” meaning that winner keeps any marbles that he or she won in the game: “[Marbles] were a form of currency among those who played with them; moreover, one was not supposed to buy marbles; one was supposed to win them” (Smith & Abt, 1984). Winning the game was seen as a sort of right of passage. The game is therefore very competitive and has a lexicon that is reminiscent of battle: “When, in the game of marbles, [a player] cries ‘Fen hist!’ he is using the same verb (albeit in a different sense) with which an armed knight charged into the fray, ‘God fend the right!’” (Horace, 1956). At the end of the game, a child cries out “smuggins,” which formalizes the transaction and allows the winner to take possession of what are essentially his spoils of war. The determination of the girl in the painting has paid off. Not only has she won marbles, but she has won the respect of her opponents in a game that was predominantly played by boys. This is indicative of wartime labor, which “entailed gender-role-violating behavior by working-class women” (James & Olson, 2006). World War II broke out in Europe on September 1, 1939––just one day before the Rockwell’s “Marble Champion” appeared on the cover of the Saturday Evening Post. Although the United States would not officially become involved in the war until 1941, American companies, such as Alcoa, began producing war material in the late 1930s. Although the concept of “Rosie the Riveter” would not be introduced for another three years, women were already at work in factories in 1939, serving their country on the homefront. The little girl in the painting’s determination reveals that she wants to win the game, but it can also be taken to represent the resilience of Americans throughout the Great Depression and the growing patriotism as the country headed towards war. Basinet, Alan. “Marble Alan’s Encyclopedia Marble Reference Archive!” Accessed August 1, 2018. http://www.kingofalltechnology.com/basinetmarbleinformation.htm. Merriam-Webster. “Knuckle Down.” Merriam-Webster’s New Collegiate Dictionary. 8th ed. Springfield, MA: Merriam-Webster, 1977. Reynolds, Horace. “All Mines, Fellas, All Mines!” American Speech 31, no. 1 (1956): 35-39. Accessed July 10, 2018. https://www.jstor.org/stable/454014.